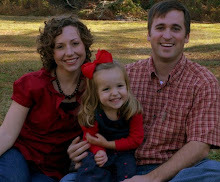 Just wanted to share a few pictures...we are loving our time together as a family of 4!! 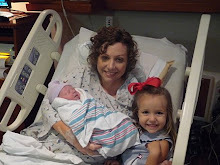 Helen is a SUPER big sister and is extremely interested in all things baby. Ethan had his first "outing" (other than to doctor appointments) to the pumpkin patch at Helen's preschool for some family pics. He is such a sweet baby...loves a bath...a good sleeper...and is GROWING...up to 10 lbs 11 oz this week!! Hope all is well and you are enjoying FALL!! I know all of you remember JR...well I spoke to his dad Rudy this morning. He said that on Tuesday of last week they told them that JR was probably not gonna make it. They arranged for his mom Kimberly to get to hold him on Wednesday. Rudy said that she held him for hours. Imagine two months and not being able to hold your child. Later that night JR started getting a little better. On Thursday he improved more and on Friday they took JR off of ECMO. This is nothing short of a miracle! Rudy said that they still have a long way to go but this is a good sign! Rudy and Kimberly are giving all the glory to God! I asked him if we could do anything and he said to continue to pray for his son. I told him that we had a great group of friends and family that were prayer warriors and they would be on their knees for his son just like they were for Ethan. They have been keeping a journal on www.caringbridge.org/visit/jrgibson/journal. (See link on right side under "Please Pray"). I just found out about the journal or I would have told everyone sooner. He will also send me his address tonight and I will post it if anyone wants to send them anything...they will be up there for a long time unless God decides that JR can leave sooner. Praise God! What a busy week we have had since Ethan has been home!! He is doing wonderfully!! We came home Wednesday, September 30, with no monitors or medication. 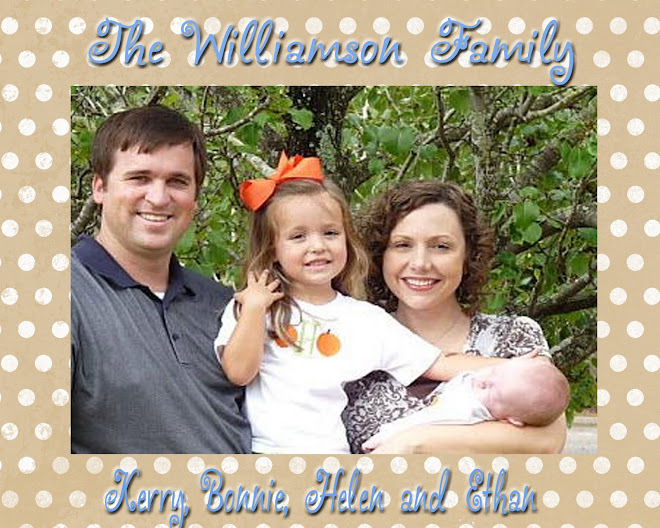 His NICU pediatrician in Birmingham fully discharged us to our pediatrician here in Dothan. We do not have to go back to Birmingham for any follow-up appointments - PRAISE THE LORD!! He weighed 8 lbs 15 oz the day we left Birmingham and had gained to 9 lbs 6 oz as of his doctor's appointment on Tuesday. His pediatrician here in Dothan said his heart and lungs sound great, and we don't go for another appointment until his 2-month check-up...just like any other healthy newborn!! We are AMAZED that he is "fully recovered" after being so terribly sick, and we are so thankful for the Lord's healing power!! Helen has been SUCH a good big sister. She loves kissing and hugging on him and "playing" with him in his crib. She loves helping with diaper changes and thinks it is HILARIOUS when Ethan tee-tees or stinkies on one of us! She spent the past two nights with Meme and Jack (Bonnie's parents), so Bonnie and Ethan have thoroughly enjoyed some quality bonding time. Everyone has been so great to call and bring us meals...we are so thankful for the friends and family in our life. Walking in our house for the first time in 3 weeks was the best feeling. We will never forget the relief it was to have Ethan at home and to have our whole family in the house together. 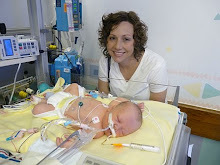 We are praying that Ethan will stay strong and healthy, that Helen can be re-trained to sleep all night in her own bed, and that Mama and Daddy get some rest too! Here are a few pics from our first week at home. Much love to you all!! Bonnie just called and wanted to share the most wonderful news!! They are on their way home with Ethan!!! God has been so faithful and brought them so far in 3 weeks. Please pray that they will arrive home safely this afternoon and that Ethan will continue to be healthy. Words can't express how grateful they are for every ones prayers and concerns. So many people have graciously offered to help in any way they can. And although Bonnie and Kerry can't wait to introduce their son to everyone, they will have to be extremely cautious about having any visitors right now. The doctors stressed that Ethan not have visitors for several weeks to allow him to adapt to his home and not be overstimulated. The best thing we can do is continue lift them up and ask the Lord to protect his little body from infection or sickness. Also, pray that Bonnie and Kerry will be able to balance life with two children who need them! There's an empty bed in the NICU...we're "ROOMING IN!!!" We got to spend the night with Ethan in a private room at Children's Hospital last night. His doctor wants us to be with him 24 hours a day for a while...taking care of him on our own...as he is still being monitored closely to make sure he's gaining weight. Ethan is off of all his stat monitors, so we are flying blind for the first time. This has been somewhat hard to adjust to since, up until now, we've watched monitors that tell his every breath and heartbeat. Ethan is very laid back...just like his daddy. He rarely makes a PEEP. It is so very wonderful just to simply be able to hold and love on him, free of wires and tubes, look him over and marvel at God's perfect creation. Today, we'll give him his first sponge bath!! We are all doing GREAT and pray this means home is not far away!! PRAISE THE LORD!!! Ethan's oxygen cannula was removed this morning!! We have been kissing on those sweet checks all day!! He is now off of all meds, IV nutrients, and oxygen and is eating like a COW. He took 62 cc's tonight at his 6:30 feeding. His stats, including the oxygen levels in his blood, are all great. The nurses are removing his PICC line tonight as well. He sleeps a lot... which is a change for us. Those of you who know our little girl, Helen, know that she rarely sleeps to this day. So, hopefully, we welcome a sleeper to the family! If he continues to stay on this pace, we hope to be home soon. Our Jesus has healed our baby boy, and we give him all the praise and glory!! 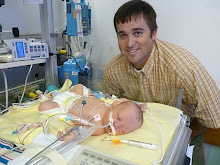 Please continue to pray for Ethan, JR, and all the other NICU babies that we have come in contact with. We love and so appreciate you all! !